Buy this item and earn 669 ClubPoints. 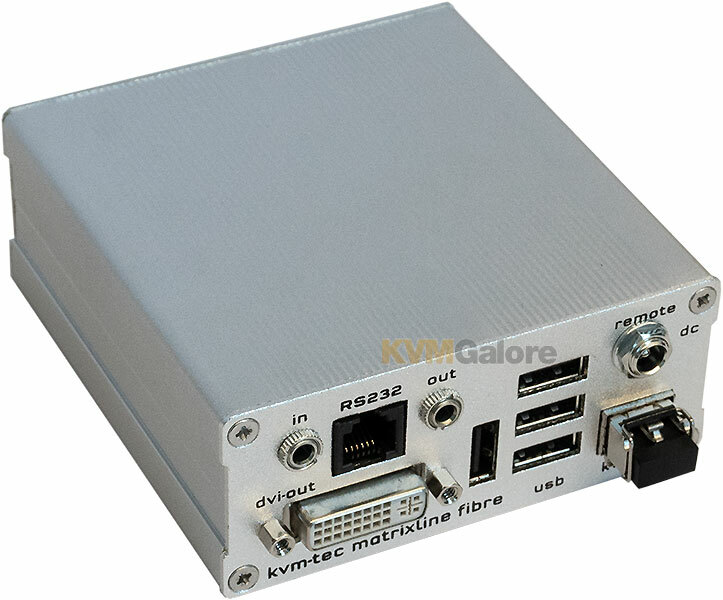 Ultra-flexible KVM extension system over IP for the transmission of USB 2.0, DVI (or analog VGA) video at 1920x1200 @ 60Hz resolution, CD quality sound and RS-232 signals 1640 feet over a 2-strand Multimode fiber-optic cable. Optionally, you may connect the Local and Remote units to a 10GB Ethernet network switch, which will in turn support a total point-to-point extension distance of 3280 feet (1000m). A perfect tuning of the kvm-tec video compression with a low latency time enables the signals to be transmitted without delay. USB and video are transmitted via the same cable. 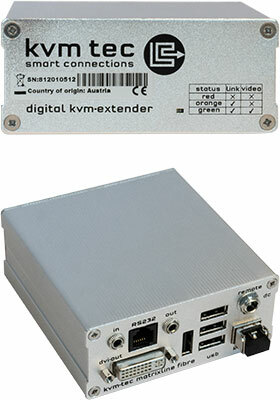 The DVI extension without loss of quality allows Full HD video to be transmitted in real time. A USB 2.0 memory option is included supporting USB memory stick and USB hard drive. When enabled, this option allows the use of a USB memory stick or a USB hard drive for transferring data. With the included matrix switching system, MX2000 can be used with a dedicated 10GB Ethernet network switch to create one-to-many and many-to one configurations, or even a complete many-to-many KVM matrix switching system without any additional hardware. 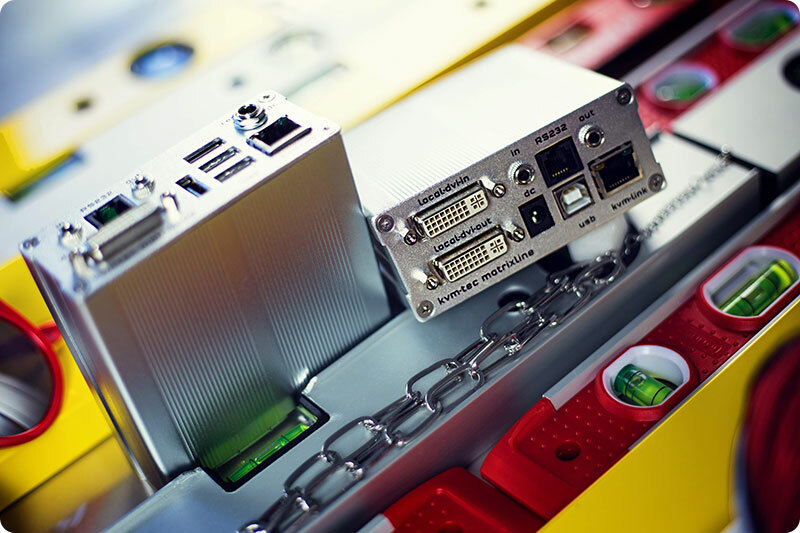 MX2000 on-screen display (OSD) system is then used to control the connections of your matrix. 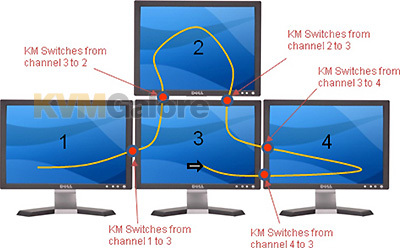 Additionally,the included KVM-SM2000 Switching Manager kvm-tec's intelligent software provides easy and intuitive management of all KVM extenders in the switching system. Operated via the included Switching Manager, Mouse Glide & Switch feature supports cursor switching, controlling multiple computers using only one mouse and one keyboard, switching between computers by moving the cursor from one screen to another. Different sizes of monitors can be combined and arranged as desired. An arrangement of up to 8 monitors (displaying video from eight computers) can be horizontal or vertical - comparable to a virtual desktop wall. Mouse Glide & Switch feature is ideal for ergonomic and efficient working at the workplace. The simple dragging of the mouse from one monitor to the other allows a very user-friendly and intuitive operation. No hotkey switching is necessary. With Mouse Glide & Switch feature and without additional hardware, the mouse and keyboard are automatically switched from one PC to the other based on the user's location of the mouse-cursor. For better orientation, a mode can be activated which briefly shows a red frame on the screen corresponding to the PC that has keyboard/mouse focus and is being controlled. Listed below are additional products to consider which are compatible with MX1-FR2000 Matrixline Single, Multimode Fiber - Remote Unit. These items may be required to complete your system.